Massive Audio - BLX2 | BLX2 | Endstufen | Toms-Car-Hifi - Kaufen was Freu(n)de macht! 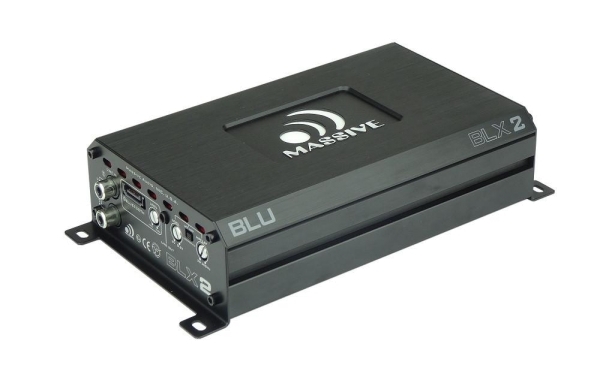 Massive Audio NANO "BLU" Series Amplifiers. The four CTA 2006 certified models include the BL1 Mono Block, BLX2 Two Channel, BLX4 Four Channel and the BLX5 Five Channel. NANO BLU amps are only 4.25” W X 1.6” H and range from 6.5" to 10.86" L. All models feature Digital Platforms, Built In OEM Line Converters, Up to 9V In, Line Out, Auto Turn (no turn on wire needed) with 12V out and support a USB which accommodates the optional UBT1 Bluetooth Dongle for audio streaming. All Nano "BLU" Amps use nickel plated RCA inputs and circuit boards are sprayed for water resistance and then everything gets shielded in a rust proof aluminum housing. Each model supports a "Docking Port" to plug in a optional custom matching Railcap Booster (RCLX).